I visited our local farm shop yesterday to stock up my freezer, the one thing I wouldn't freeze is a whole chicken and the chickens from Kilnford Barns are delicious. It's been a busy weekend so I didn't want any kind of complicated recipe and was just going to do a straightforward roast. However, I was tidying up my cookbook holder (many printed out copies of recipes, sauce splattered magazines - you know what I mean) and found the little BBC Good Food booklet '80 best-ever recipes'. On the front cover was a roasted chicken so I read on...basically, put it all in the oven and leave it for 2 hrs 20 mins - ideal for my purpose! You can get the full recipe on the BBC Good Food website HERE . However, of course, I did make a few wee changes I didn't have two garlic heads, so used a glug of Roasted Garlic juice (from a bottle). I also didn't want to open a bottle of white wine so I used a small bottle of Crabbies Alcholic Ginger Beer and, oh boy did that make great gravy - I think a good cider would give a similar result. 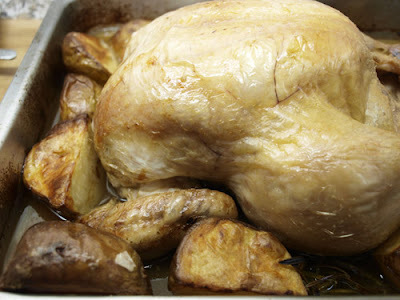 The long slow roasting with the mixture of stock and your choice of alcohol made the chicken very moist and delicious. I was a bit concerned that the potatoes would be soggy, but they were nice and soft inside and crisp on the outside, not quite like the roast potatoes I would normally make, but they had absorbed the lovely flavour of the chicken, herbs and gravy, quite delicious. I love roast chicken, of course, and this sounds really good. The alcoholic ginger beer is a great idea - I've got to try that. Ooh.. Ginger beer gravy... now that sounds good! You should try my 10 hour slow roast chicken. Best thing I've ever eaten! I have that little book and it has some real gems in it.......of which one is that DELICIOUS looking chicken, I imagine that it was super moist cooked that way too! I have this recipe stored away to use the next time the outlaws come for Sunday lunch. Glad to hear it has had such a positive result. Looks lovely and those spuds .... heaven! Chicken with ginger beer. I'm bookmarking that in my head. I love the sound of it. Mmmmm....looks very delicious. I would love this for a lazy weekend, maybe with more root vegetables added so that I don't need to cook another dish of vegetables. Ooh that's my kind of meal! I tried a Crabbies Ginger Beer for the first time in a wee lodge in Oban a few months ago. Delicious! I may have to get a few bottles now... for cooking of course! Really like the idea of using it with chicken. Good call, Janice! Wow! Using Crabbies Ginger Beer - I love the innovation! 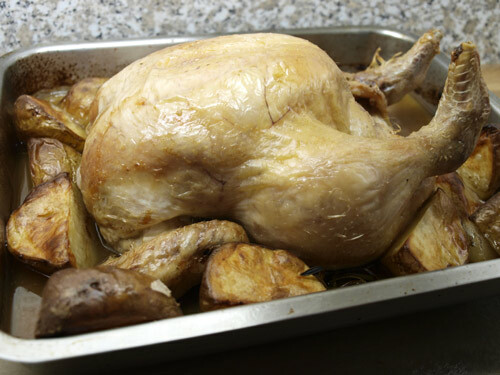 Roast Chicken is such a comforting dish - isn't it?